ORLANDO, Fla. – In “Harry Potter and the Deathly Hallows Part 1,” which was released this past weekend, fans find Harry, Ron and Hermione away from Hogwarts grounds. Luckily for Muggles, you can still get your fix of the School for Witchcraft and Wizardry as well as the neighboring village of Hogsmeade. 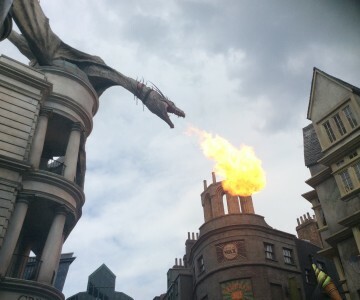 The Wizarding World of Harry Potter, a 20-acre park inside Islands of Adventure at Universal Orlando Resort, opened this summer. Here are four musts for any Potterphile in need of a magical fix. The most popular attraction within Wizarding World is Harry Potter and the Forbidden Journey. But better than the actual ride might be the line, which weaves its way through iconic locations from both the books and movies. Visitors make their way through the Herbology greenhouses and Albus Dumbledore’s office. At the Defense Against the Dark Arts classroom, Harry, Ron and Hermione explain how Floo Powder will allow Muggles (non-magical people) to join them on an adventure. Talking portraits line the walls and provide entertaining banter. Though the recipe has yet to be released, consumers have described butterbeer as tasting like a mixture of cream soda, caramel and butterscotch. Two types are sold in 16-ounce cups: frozen ($3.99) and liquid ($2.99). Souvenir cups hike the price up to $9.99. They can be purchased at the Three Broomsticks or at the butterbeer cart located outside the restaurant. A word of caution: One drink is enough. Think of it as dessert in liquid form that helps ease the Florida heat and humidity. A wandkeeper helps an up-and-coming witch or wizard find a wand with the help of special effects, much like the scene in “Harry Potter and the Sorcerer’s Stone.” The line at Ollivanders wand shop to take part in the interactive experience can take about two hours because only eight people are allowed in at a time. Only one person is chosen to have a wand select them. For those who don’t have the patience to wait in line, the back section of Dervish and Banges, a store connected to the Owlery, sells various wands. Buyers can choose between character wands- Hermione’s is the most popular- or one that corresponds to their birthday. If a friend couldn’t make the three-hour plus drive to Orlando, you could always send an owl. In Dervish and Banges, Wizarding World of Harry Potter stamps and postcards are sold. After filling out a message and an address, it’s set to be delivered in a timely fashion to anyone, anywhere by owl post. Who could forget the joy Harry Potter felt when he found out he was a wizard? In the other areas of Islands of Adventure, there isn’t as much attention to detail. At Wizarding World, however, “students” wear their Hogwarts robes despite the Florida heat. They also speak in British accents. Ask them about a football game or how to use a modern device such as a camera and they’re clueless. And completely in character. Hours of Operation: Times vary. Monday-Friday is generally 9 a.m.- 6 p.m., Saturday-Sunday 9 a.m.-7 p.m. Cost: A non-Florida resident one-day, one-park pass is $82. A Florida resident one-day, one-park pass is $70.99. A Florida resident annual pass ranges between $139.99-$289.99. Visit universalorlando.com for more information.